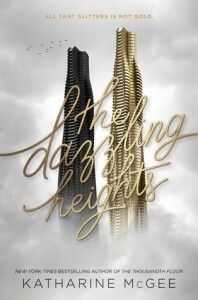 The Dazzling Heights is the second book in The Thousandth Floor series (book 3 is coming out in August). I read the first book in November and really enjoyed it. Book 2 did not disappoint either! The book was built like the first one and it is something I really enjoyed. It is different from most trilogies where the book in the middle is often meeh because it’s just the middle of the story and nothing really happens. It was not the case at all in this book, the structure plays a really important part and I guess the third book will be built the same. At the beginning, you understand that someone died but you don’t know whom and you discovered it only at the end. I loved this concept. I can’t tell a lot about this book without spoiling you the first one, so if you have not read it yet and don’t want to be spoiled, don’t read this review any further. Did you honestly guess who was going to die? I had no idea. I could not make any assumptions and when I discovered it was Mariel I was a bit shocked to be honest. I knew it would not be Leda because it would have been too obvious, but I did not expect it to be Mariel. I hope we will get more of her in the third book, in a sort of flash back or something to know what she was up to during the book. I shipped Leda and Watt SO HARD at the beginning of the book so I was really happy by the development. I think they are so perfect for each other. I enjoyed all their scenes. Calliope is really something. I totally adored the introduction of her and her mom, I think they were amazing characters and they complicated things even further, which was great. I did not particularly enjoyed Avery and Atlas in this book. I liked them in the first one, but I did not particularly cared about what happens to them at this point. Rylin’s storyline was a bit less interesting as well in this book, I would have liked more development with Cord; they barely spoke at all during the whole book. But I liked the fact that she got to know Leda a little bit more, I think they could be great friends. I really can’t wait for book three because the ending was not enough! Everyone discovered so many things at the end and you don’t even know their reactions to those revelations. You also know who died but you have no idea how it happened (well I have my theories but we’ll see). It was a really great book and I think this series will be one of my favourites.